What a couple of weeks!! You may remember my comments last month on the strong performance of the sub $600k market and the renewed energy around properties $1.2mil+. Following from that this month has seen much of the talk from many real estate commentators predicting a strong push back to residential investing. At our ‘Property and Wine Expo’ on Wednesday night Michael Matusik gave evidence around the good condition of the market for buyers and was extremely positive around the Inner city products. The night saw over 100 attendees filter through the QA Hotel and heard from other industry speakers – Andrew Coulter ‘Metro Properties’ (regarding the booming sales in off the plan properties at ‘Brooklyn on Brookes’) and Chris Condon conducting the ‘World Cup’ of wines. For any information regarding the information please email the office propertyexpo@rwnf.com.au . On aside note earlier today I was fortunate enough to again be involved in the annual ‘Mango Auction’. 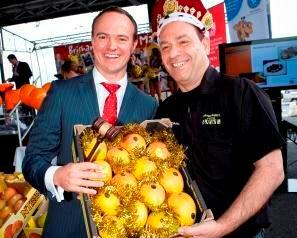 This event in held around the country each year and sees the ‘First Tray Of Mango’s’ sold at the Brisbane Markets. The event is always well supported by growers, wholesalers and retailers at the Markets and this year was no different. 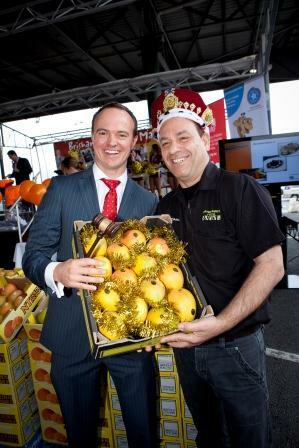 Carlo Lorenti, from ‘Clayfield Market Fresh’, was again the ‘Mango King’ this year bidding $30,000!!! to be crowned for the 5th time!! Another $10k approxiamtley was raised thorugh other auctions and sales this morning meaning $40,000 was donated to Red Ktye (http://www.redkite.org.au) and Life Ed (http://www.lifeeducation.org.au) . For an up-close look at the property market please feel welcome to attend out upcoming auctions: Tomorrow 1pm at 13 Mole St New Farm and Next Saturday 22nd October from 10.30am 50 Properties go under the hammer at the ‘Emporium Hotel’..